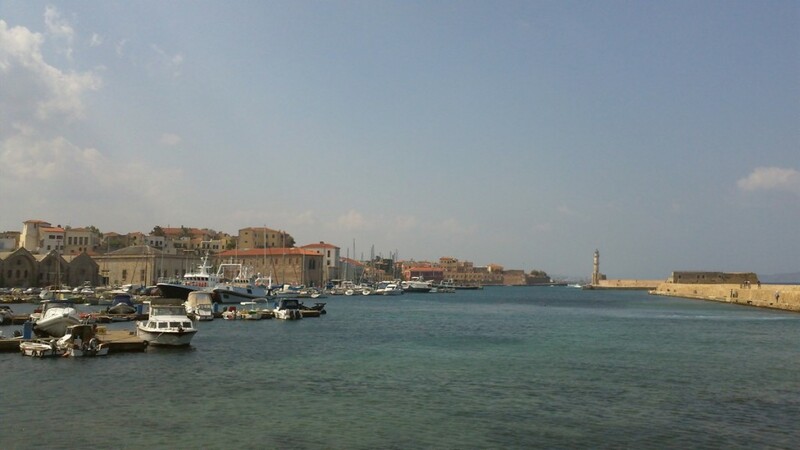 Chania, Crete was our fourth and final port of call on our Mediterranean cruise in 2011. 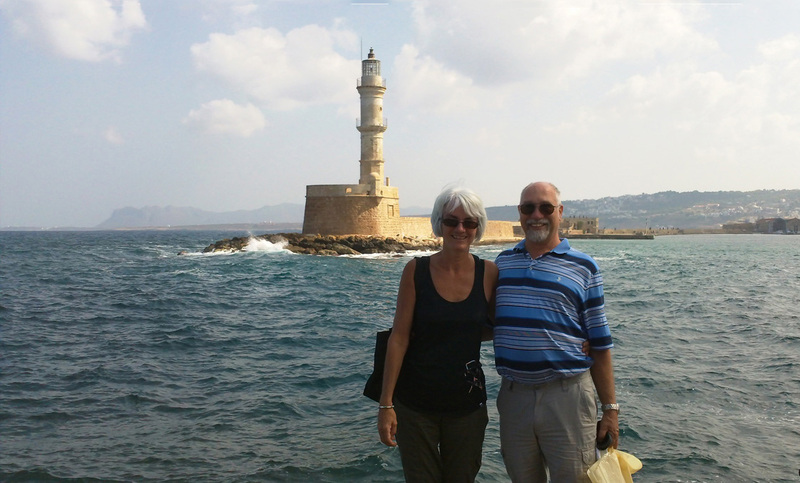 As is always the case with cruises, there were a variety of excursions available, but we opted to explore on our own. We do this in about half of our ports of call and always come away with a satisfying experience. 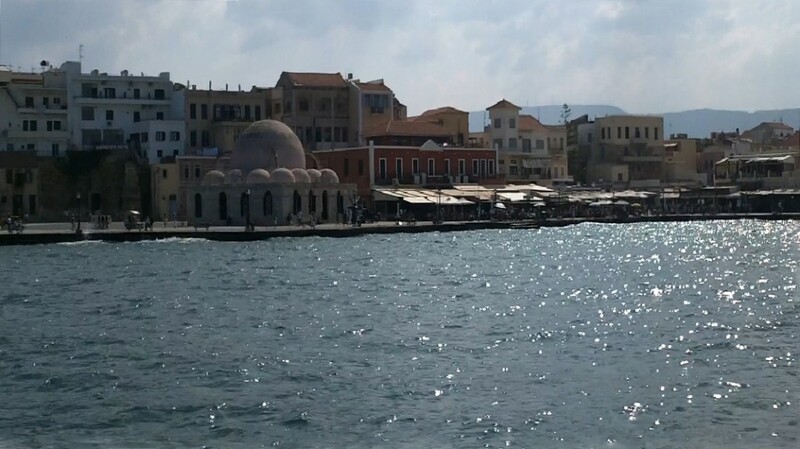 In this case, a complimentary bus took us from the cruise ship terminal to the old town of Chania. 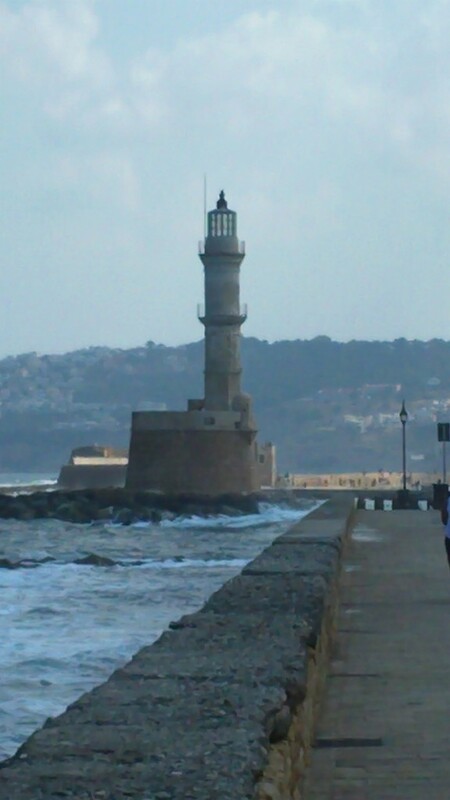 It is Crete’s second largest city. 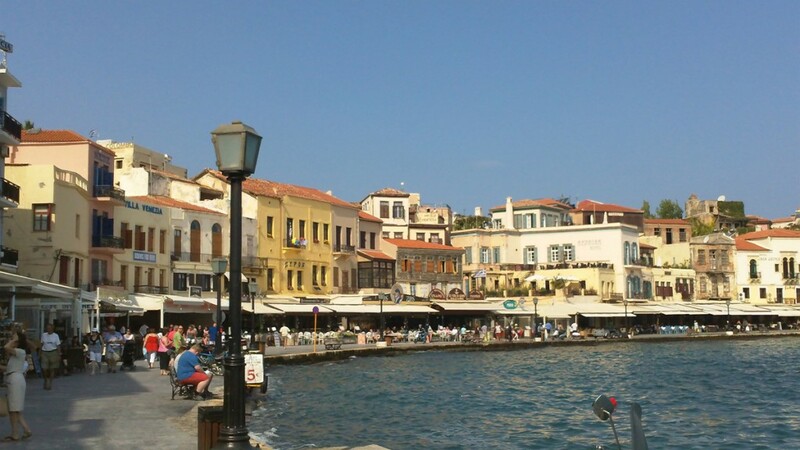 Along with its Greek influence, there are elements of Venetian and Turkish heritage in Chania, most notably in its cozy little harbor. 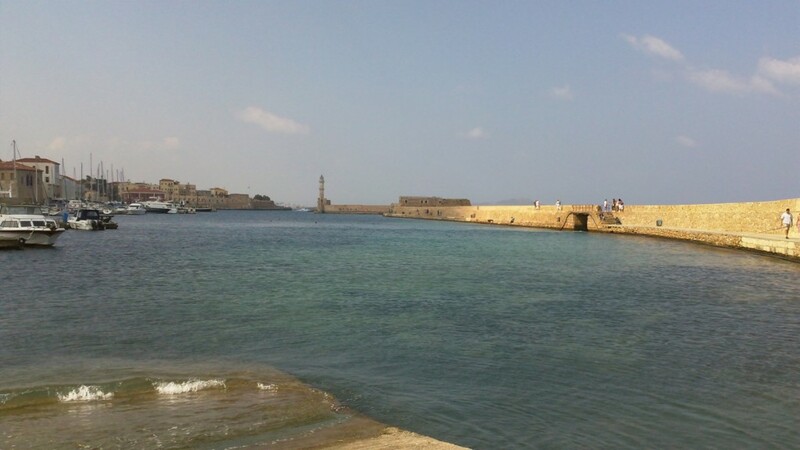 A moderate sized bay is partly enclosed by a long breakwater which is covered by stone wall and a walkway. 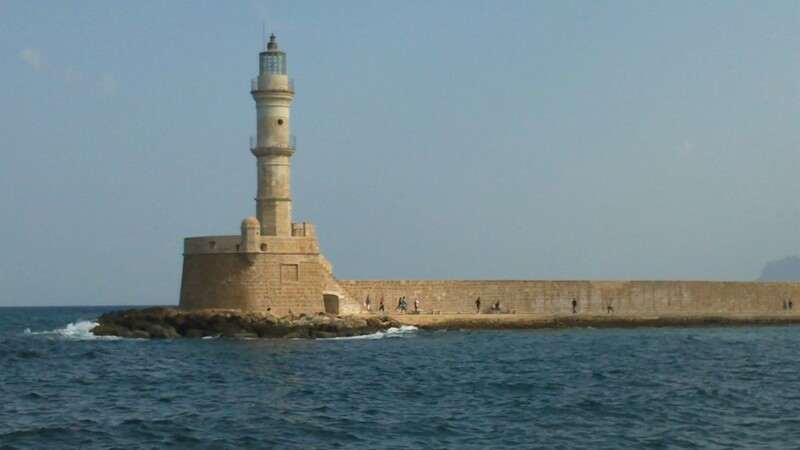 At the end of the breakwater is the famous Venetian styled Chania Lighthouse. 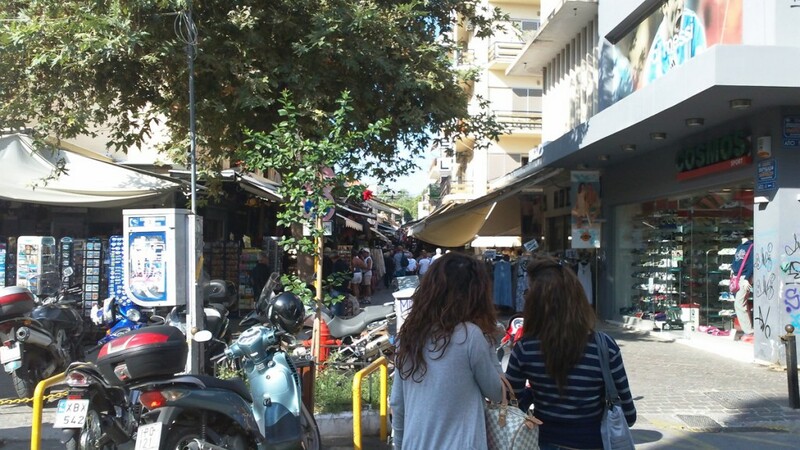 The bus drops you off at a few streets away from the harbor and you first make your way through a lively area filled with shops selling local wares and souvenirs. 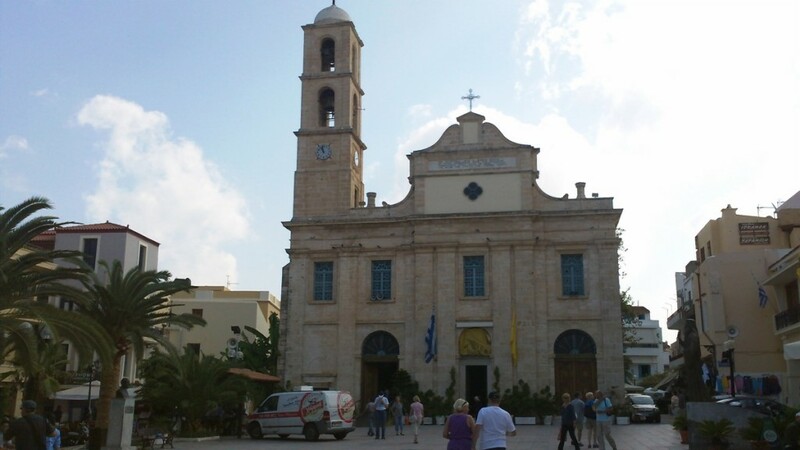 Heading towards the waterfront, we passed an old church. And then we arrived at the bay. 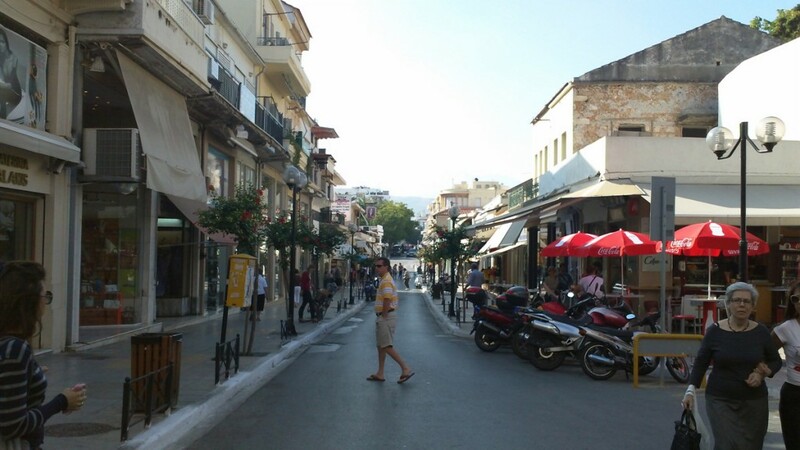 A broad walkway edges the semi-circular bay, with colorful shops and restaurants everywhere. Shops and restaurants line the bay. We walked along the path to our left taking us to the one end of the bay. Across the narrow gap of water stood the lighthouse. 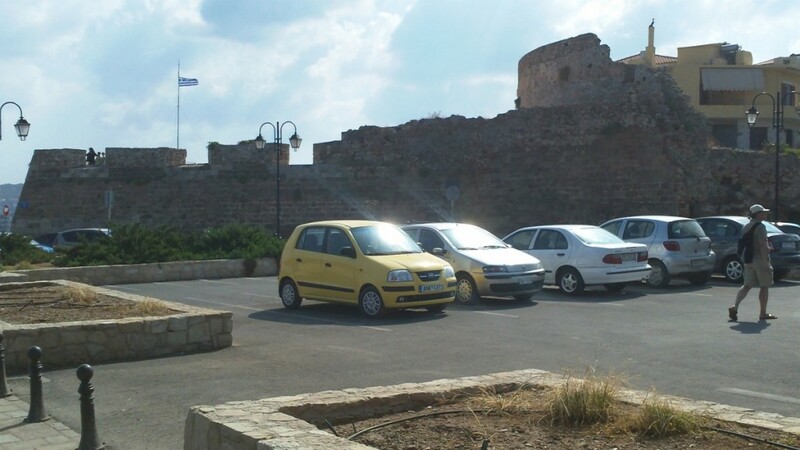 Behind us were the remnants of an ancient Venetian fort and a large red brick building, the Nautical Museum. The bay is accessed by a narrow gap between the western end of the bay and the lighthouse. The red brick building is the Nautical Museum. We didn’t visit the museum but walked around the corner and back and then circled the the bay to the harbor and marina. We passed many restaurants and later had lunch at one. 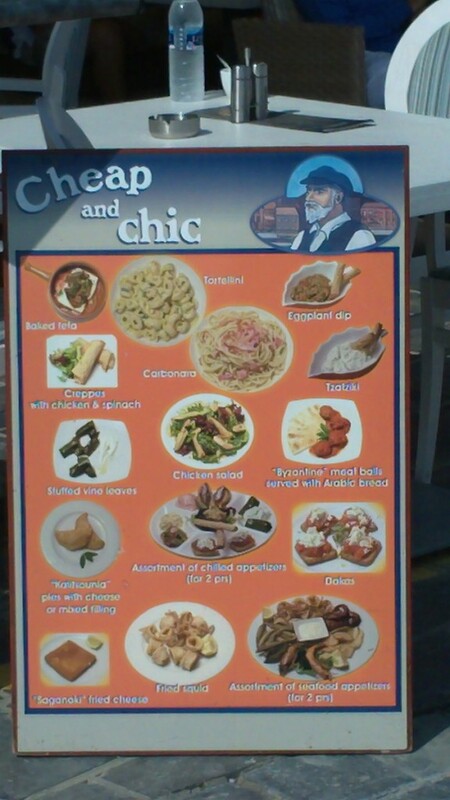 A great variety of food is offered and we were amused to see a sign advertising one restaurant’s fare as “cheap and chic”. Along the way we passed an ancient mosque, a remnant of the Byzantine era. The Mosque of the Janissaries is, in fact, the oldest remaining building on Crete from the Turkish era. It dates from 1645 and stopped being use as a mosque in 1923. 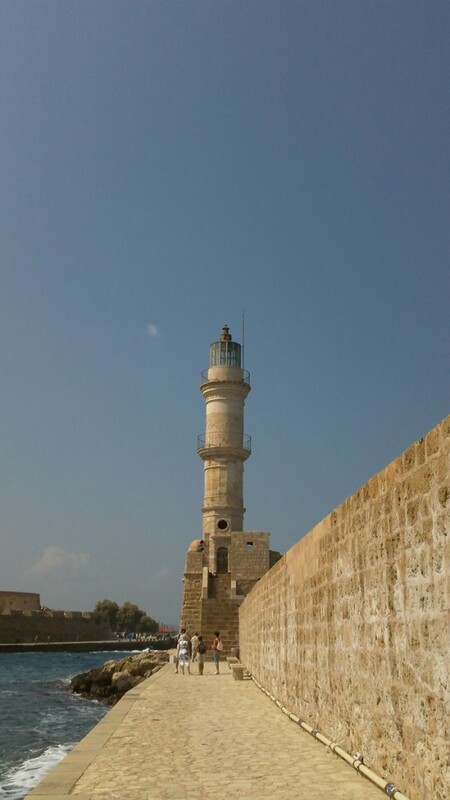 Its minaret was destroyed in World War II. We also passed an attractive horse and buggy for hire before we came to the end of the harbor. 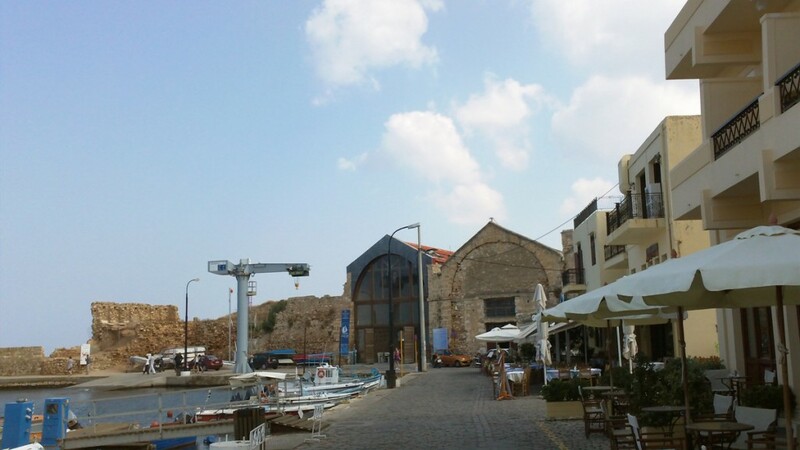 There we found another maritime museum of sorts, the Chania Sailing Club where they had some artifacts on display and were recreating an ancient ship. I have a pamphlet from this place but it is back in Canada. (I’m in Australia right now) I’ll add additional info if needed when I return in September. 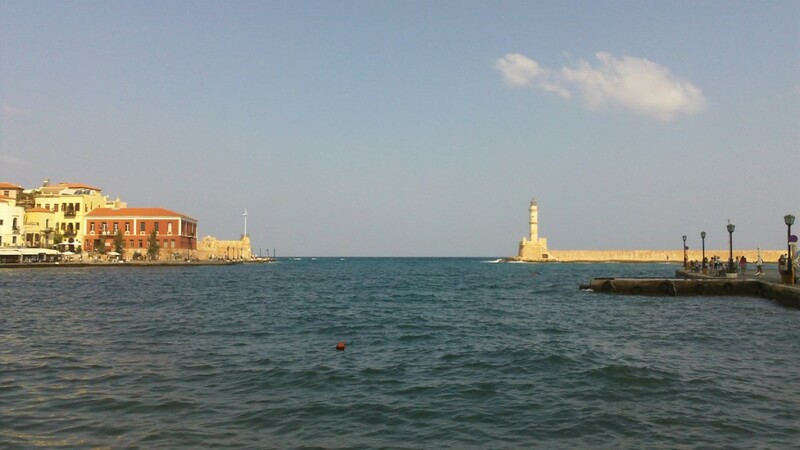 Chania Sailing Club. The building dates from 1607, built during the Venetian era, and was restored in the early 2000s. It used to be an arsenal. 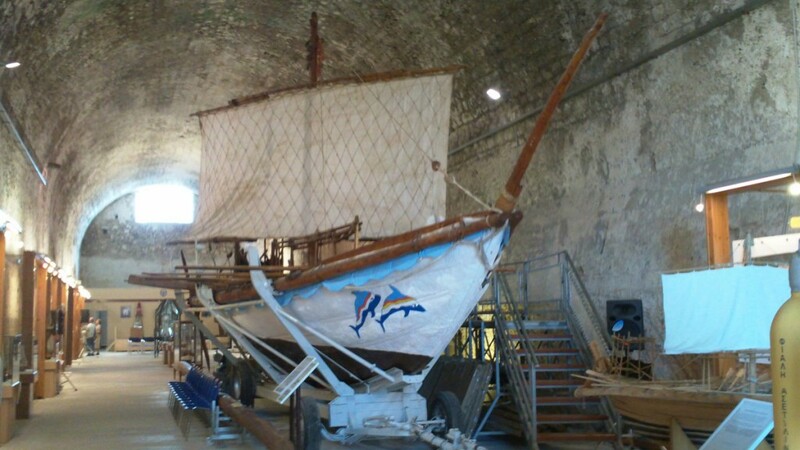 Recreation of an ancient sailing ship at the Chania Sailing Club. We then headed out along the breakwater to the lighthouse, about half a kilometre. It’s a half kilometre, a five minute walk, to get to the lighthouse at the end of the breakwater. The marina is on the left. About two-thirds of the way to the lighthouse is an elevated rampart that gives an excellent view of the bay as well as the light house with the Nautical Museum in the background. A view of the bay from the rampart two-third of the way along the breakwater to the lighthouse. The lighthouse is about 135 yards away with the museum in the background across the water. Eventually we made our way to the bus stop and the trip back to the cruise ship. 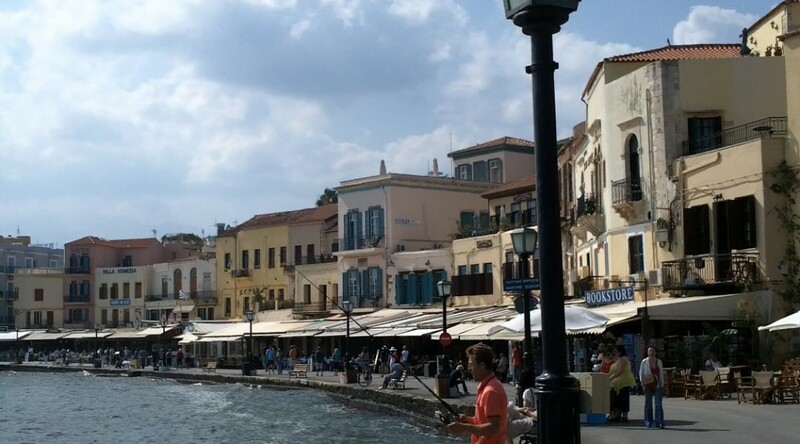 We enjoyed our visit to the old town of Chania, a snug little harbor steeped in history and picture perfect. Be sure to check out the additional photos in the gallery linked below. Or scroll on down if you are on the main page. 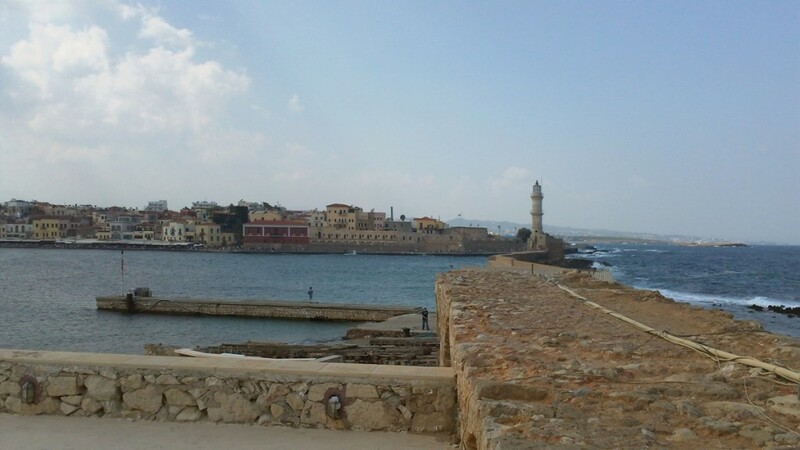 Here are some additional photos of our visit to Chania, Crete. 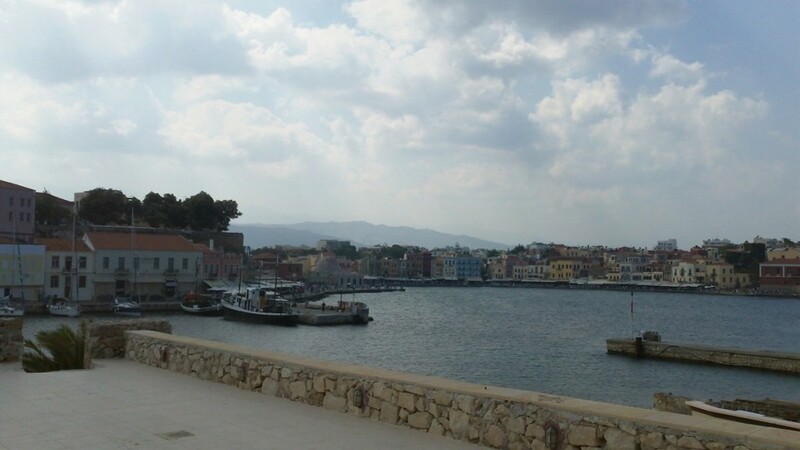 Looking down the street toward the bay and harbor of Chania. 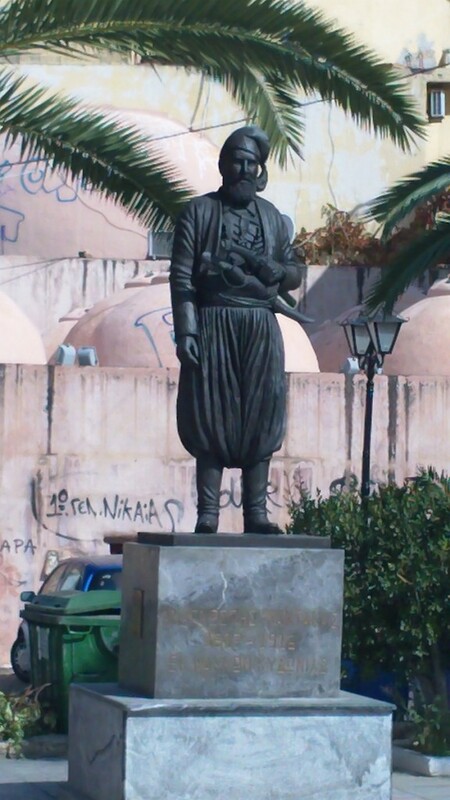 A statue of some famous Cretan. 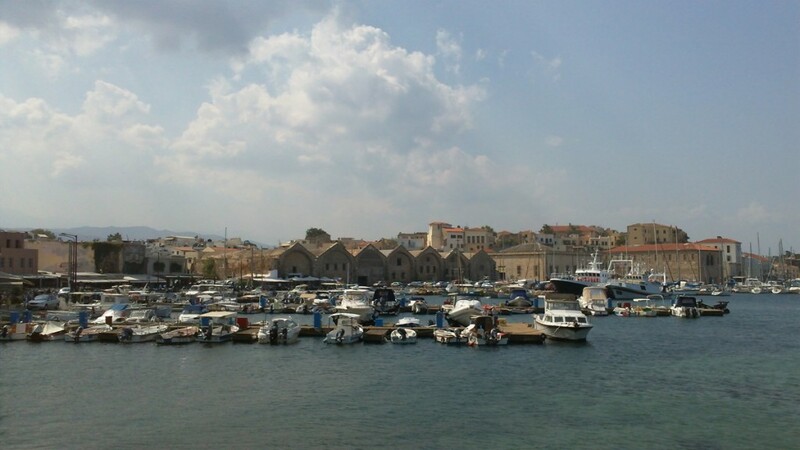 The most famous person to hail from Chania is probably world-renowned folk singer Nana Mouskouri. 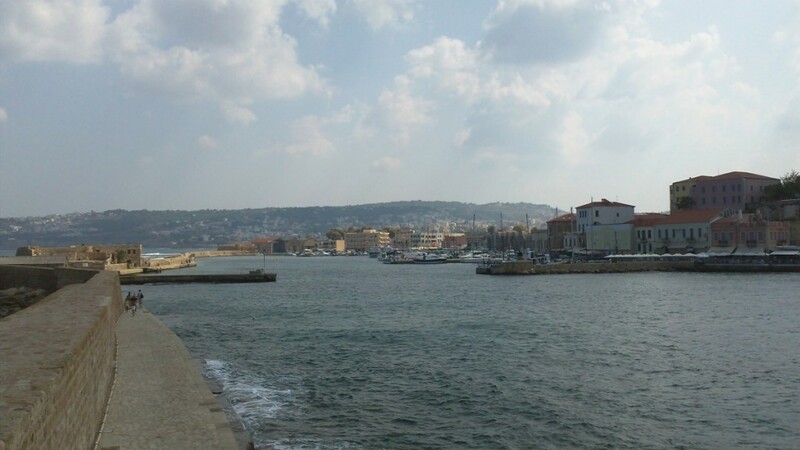 The marina on the left with the lighthouse in the distance. 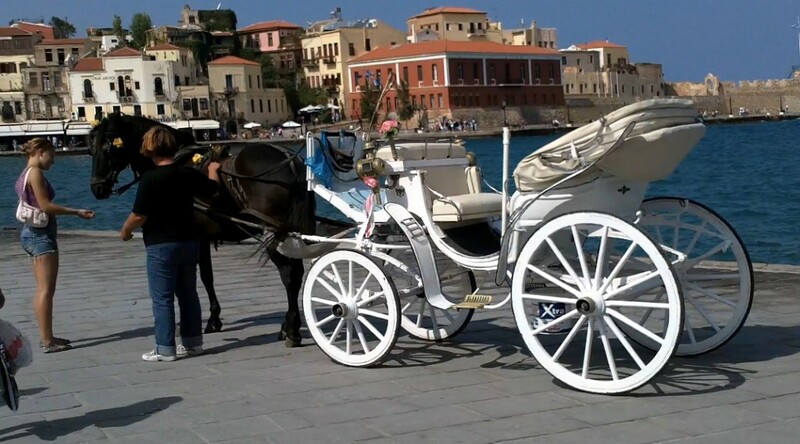 You can rent this horse and buggy for a ride around the scenic old town of Chania. Many restaurants line the walk around the bay. Did I mention you can get food here that is both cheap and chic? Inside the Chania Sailing Club. 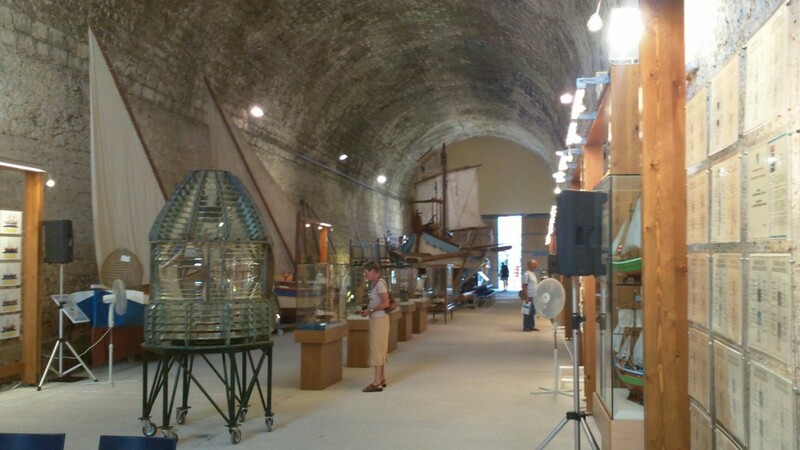 A number of artifacts are on display here, including the refracting cover of an old lighthouse lamp. 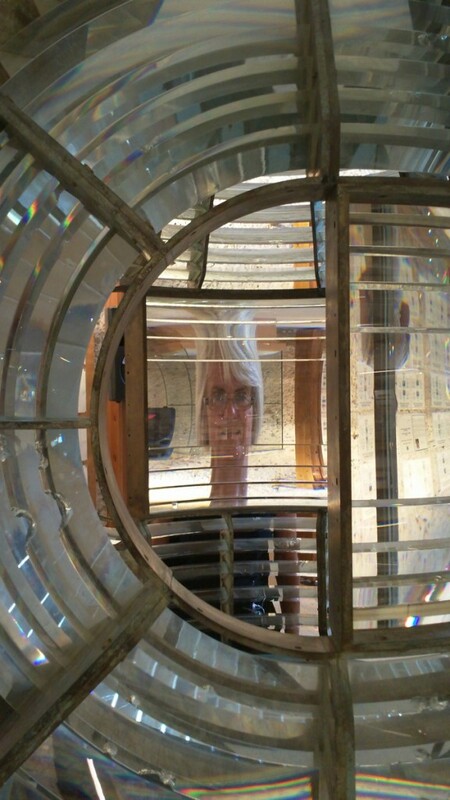 Janis through the lighthouse lens. The other side of the Venetian fort at the west end of the bay. The lighthouse seen from the west side of the bay. Looking back at the harbor from the lighthouse.